BDS activists. Photo: Mohamed Ouda via Wikimedia Commons. BDS (the Boycott Divestment and Sanctions movement against Israel) is an international campaign that was started in 2005 by several different Palestinian NGOs to pressure individuals, organizations, and nations to apply economic, academic, and cultural pressure on Israel. As such, it is not one central organization, but rather a general term for various groups and activities that promote BDS principles. It can take the form of a spontaneous anti-Israel rally of activists with little to no connection to each other, or it can include full-blown lobbying activity by actual NGOs and official groups like student unions. The morality of BDS activities has often been questioned, and critics, such as Jewish human rights group the Anti-Defamation League, accuse it of outright anti-Semitism and trying to delegitimize Israel. But now, opponents of BDS are fighting back. Whether it is the recent wave of anti-BDS legislation in Europe and the United States, or the failure of particular BDS efforts and campaigns around the world, something is changing. In May, Illinois Governor Bruce Rauner signed a bill (which passed unanimously) that requires state pension funds to divest from companies that support the BDS movement. Similar bills have recently passed in the Indiana, Tennessee, and South Carolina state legislatures. In the state of New York, such a bill is currently in the works. In June, President Obama signed Trade Promotion Authority legislation, which contained several anti-BDS provisions. (It should be noted, however, that Obama is contesting some of these). More recently, an attempt by former Pink Floyd bassist Roger Waters – now a vocal supporter of BDS – to dissuade Brazilian musicians Gilberto Gil and Caetano Veloso from giving a concert in Israel, was thwarted. Veloso wrote a letter to Waters, stating “I think it is counterproductive to isolate Israel. That is, if you are seeking peace. I have many doubts about such a complex subject. I would never cancel a show to say that I am basically against a country, unless I was really and with all my heart against it. Which is not the case. I remember that Israel is a place of hope. Sartre and Simone de Beauvoir died pro-Israel,” wrote Veloso. These are just some examples from the last few months. Additionally, many grassroots Jewish and Israeli efforts, as well as some from foreign supporters of Israel all over the world, have arisen to stand against BDS at every possible turn. One such organization, active in Europe, is the Israel Europe Freedom Center (IEFC). Tazpit News Agency spoke to Wilhelm T. Roth, CEO of the IEFC, about their recent successes. Roth and the IEFC are behind legislation passed in the Austrian Parliament in March, which stops national funding to NGOs that are related to anti-Israeli activity. “In terms of field work we have small victories which don’t get much media coverage; however, we did have two big victories recently in Europe, blocking BDS campaigns,” said Roth. The more known incident Roth was referring to happened in Denmark in April when a local BDS group posted advertisements on Copenhagen city buses, calling on the public to boycott Israeli made products. IEFC, along with another NGO, My Israel, successfully petitioned the Movia bus company to remove all such ads from their basses. 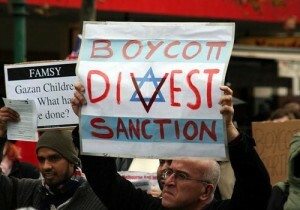 While many challenges remain, it’s clear that there is an answer to the BDS movement.